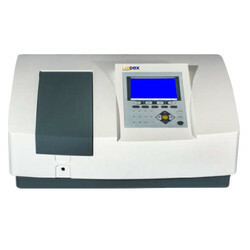 Double beam Spectrophotometer LX240DS is a high sensitive double beam spectrophotometer with a wavelength of 190 to 1100 nm for absorbance spectra of chemical and biochemical compounds. Equipped with a bandwidth of 2 nm for peak resolution, it works on detection of light intensity between reference and test sample. The highly stable optics and silicon photodiode detector measures the sample and reference simultaneously optimizing the measurement accuracy.